Note: As of 17 August 2017, the trial has still not happened three and a half years later. The ‘shooter’ escaped twice and was subsequently shot and killed in July this year. We wait to hear what happens to the remaining 4 who are still in custody…. This doesn’t make easy reading, nor was it easy to tell. But it’s a story we believe needs to be told because although our lives have been torn apart, ours is not a unique situation. To have someone murdered in South Africa for something as trivial as a mobile phone, happens on a daily basis and, inconceivably, is considered to be a ‘normal’ occurrence. As a family, we lived in South Africa for 35 wonderful years – I will always be glad I had the experience of growing up in London and then spending more than half my life in Africa. But it wasn’t all wonderful. We came to regard burglary and crime in general as something inevitable, considering it with some cynicism, that we were, in effect, doing our part for the ‘Re-distribution of Wealth Programme’. We always felt relieved to find our car still where we left it, even more so when it hadn’t lost a wheel or had a window smashed. Arriving home to find that your house hadn’t been broken into and your belongings, even your underwear drawers, rifled through, always brought a sense of relief. During the last few years it became more and more traumatic. We lived in a rural area only a short distance from Johannesburg and would often hear gunfire at night, or be woken to helicopters searching the area – usually unsuccessfully. Worse still, a number of our neighbours were murdered while we were there and more have been murdered since we left. It is shocking to think that every year, thousands of people are murdered in South Africa: 17,068 in 2013/14 (1), an increase of 809 on the previous year. The majority of these murders occur in low-income areas and are not associated with pre-meditated acts or robbery but rather as a consequence of assaults (2). In a nation where murder is such a regular occurrence, it is unsurprising that most of these never hit the news, because it is ‘just another murder’. Regardless of race or nationality, every family and community in South Africa affected by losing someone this way, faces irrevocable, devastating grief, but most of these go unreported. The only ones that really hit the news are those that either effect high-profile individuals or overseas tourists with sole nationality of another country. 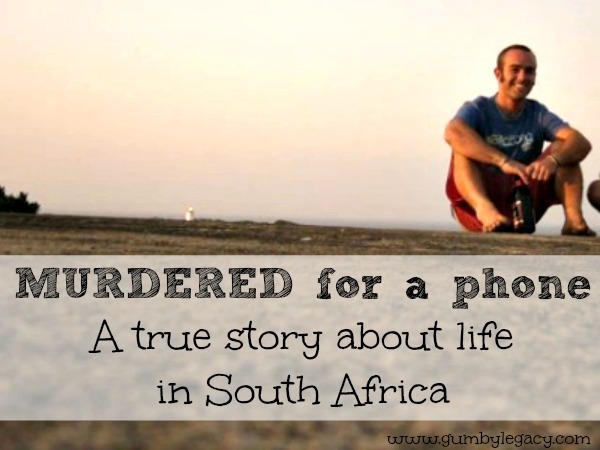 In February 2014, during a robbery, Jeremy Brooke, my son, known affectionately as Gumby, a dual citizen of South Africa and the UK, was murdered. At the time of his death he was in fact, a tourist in the country, on a dive trip to the (aptly named) Wild Coast, with a multi-national group of tourists and friends. It was not long after they had all gone to bed for the night, when five men broke into the house and held the group at gunpoint demanding phones and keys to the vehicle they were using. Gumby being the way he was, stood up to these people in an attempt to protect his friends and was deliberately held and shot. He was hit in the face and chest and in the ensuing chaos and terror, lived long enough for the group to call for help, borrow a vehicle and try to get him to hospital, one and a half hours away. Gumby reassured them all that, while he didn’t want to die, he wasn’t scared of dying. His friends tried to hold his face together in an attempt to stop the air they were blowing into his mouth from escaping. He bled to death on the way to the hospital. Tragically, life is so cheap in South Africa it seems that many perpetrators are never brought to justice and we understand that often, even when they are, the judicial process is not robust enough to end in conviction. In Gumby’s case, because of the prompt action of the tour group leader, the police acted swiftly and impressively considering the remote area they were in at the time and within hours had arrested all five of the perpetrators. Since then, they have been positively identified, the evidence has all been gathered and remarkably, in a country where getting to trial can take up to three years, a trial date has been set for December this year. We can only pray that the outcome is ‘just’. For those of us who loved Gumby we have lost a generous-hearted, free-spirit who loved nature and truly valued its gifts, sharing them with everyone he came into contact with and making them in turn a little more in touch with the amazing world around them. He made a remarkable impression on hundreds of people because he was a remarkable person and he will continue to inspire those whose lives he touched in ways that he probably could never have imagined. BUT, he isn’t the only one. Every single life that is lost in South Africa through murder, whether by accident or design, leaves a gaping hole in the lives of those who knew and loved them. How can this be allowed to carry on? No one in South Africa is safe or immune from crime and the life lasting effect it has on the people left behind. EVERYONE, including all tourists, are at risk, between 15 & 20% in 2012/13 (3). We lived on the edge of one of the most important World Heritage Sites – the Cradle of Humankind. This area is 49,000 hectares of privately owned land, much of it game farms and private resorts. Now, I understand (three years after we returned to live in the UK) that all hotels and venues in the area have extensive CCTV coverage on their properties, in an attempt to reassure potential visitors of their safety. Tourism was always under threat, and now, in a nation struggling to build its identity where tourism could potentially make a significant difference to the people of South Africa, every murder diminishes the opportunity for the population to benefit and thrive. Even nature is not immune as is evident with the decimation of the rhino population and the horrific threat of wildlife extinction. Faced with the facts, it would appear that the value of life in South Africa in general, is not very high. Our family has to wait now and hope that we will see justice done. But while we wait, I’m writing this to ask people to stop for a moment and think about what is happening here. To ask yourselves, each-other, your communities and politicians – can it go on? How many more families and friends will have to face the loss of somebody they cherish and love for the want of a mobile phone and a vehicle, worth maybe only a hundred pounds? Edited on 16 May 2015: the trial was postponed on numerous occasions since this letter was originally written but it has actually started this week. We have been warned that it may not be completed before the end of the year…. At times like this, I realise how naïve I am to the world. I had no idea life was like that there. I am so sorry for all your family have been through. Nobody deserves that. But what a beautiful way to keep his memory alive and his name being said. So sorry that you experienced this dreadful loss. I met Gumby briefly in Sodwana as a diving friend of my son Daniel’s. Gumby was such a fun-filled person but also incredibly kind. He helped my husband Glenn get past his doubts about whether he would be able to scuba dive or not. Gumby wouldn’t take any money for the time he spent with Glenn in the resort’s pool so we offered to drive to Richard’s Bay to buy steak for a braai. We had such a great time together – a big group of friends, no one worried about age or social standing, everyone was just enjoying being together and enjoying our surroundings. Later Glenn did many dives but it all began with a young man who had the knowledge and the patience to show him he could do it. We were so shocked and saddened when we heard about his death, another wicked waste of life. Glenn’s youngest brother was murdered six years ago and we were reflecting on the anniversary of our family’s loss just a few days ago. We’ll be moving to England later this year (2015) to be closer to Daniel and his sister Joanne. Glenn and I will be sad to leave South Africa’s beautiful countryside, the warmth and friendship we have experienced with many people but we also know that crime affects everyone here no matter if they are rich or poor, white or black, young or old, in cities or on farms. Electricity is unpredictable, which makes people who used rely on electric fencing vulnerable. The post office had its bank accounts frozen because it failed to pay a debt so was in contempt of court. Corruption is widespread. But no amount of outrage sees to make any difference so, eventually, you learn that being angry and bitter harms no one but yourself so you have to learn to let it all go. Not easy at all but we are all on a journey. Good luck with your projects helping youngsters learning to surf despite disabilities. It is a fitting tribute to Gumby. Hi bronwyn.so sorry for your loss and everybodys lossxxxxim living in krugersdorp S.A.we also live in fear….you never know when its your turn.everyday you will read on facebook about a new murder…it doesnt make the news.but on facebook you see it.i have kids and grandkids and we all wished that we can also leave this country.but we are not of the lucky ones that has money to even think of leaving S.A.we just have to stay and what happens must happen.i am on deppresion meds.and even while on meds i am so depressed about all thats happening in s.a.please please pray for us thats stuck here!my only wish is that the coming of Christ would come then all this madness will be no more. So sorry for your loss Bronwen for your loss, I had tears in my eyes when Rosemary told me when we had lunch together last year. Hi Bronwen. So sorry for your loss. I was intrigued by the heading of your post and decided to read through your article. I was born in SA and lived there for 26 years. My father own supermarkets there and life was great until my brother was murdered in one of our shops for no reason. He was only 22 at the time (1994). After his death I had the option to stay in SA or move to Madiera with my folks. I truly love SA as a country but deeply saddened by the crime there. I decided to stay and started my own business. 4 years down the line and truly believing things would get better there, I was attacked at home by 2 of my own employees. This was the last straw for me so I sold everything I had and left my dear country. I’m living in the UK for the last 10 years now and although the weather is terrible, it’s peaceful and there is a proper justice system. I often think of going back but when I read stories like yours, it makes me quickly eradicate that thought. Also I have an 8 year old son and couldn’t imagine putting him at that sort of risk. As for petitions, please have a look at http://www.change.org as they get worldwide coverage for petitions on all aspects. I feel so terribly sorry for the loss of your son. He was at school with my son David Stevenson and was so loved by all the boys. We are sad to be out of South Africa but I am happy to feel safe and not be terrified at night and that my children are safer. Thank you for your kind words Thea. Thanks for sharing – I am so sorry to hear about your cousin. Tolerance does seem to be at an all time low and it’s hard to see a way out of it. Bring on justice let alone swift! I pray that you will find peace – thank you so much for sharing your sad story with all of us. It should not be like this. People should not have to live in daily fear or not feel comfortable enough to want to return “home” to SA. God Bless you. Thank you so much for your kind words Helen. One of the saddest things about South Africa is the dumb acceptance of the violent crime that is ripping the country and families apart. After being robbed at gunpoint myself, and after four thugs sent my old dad to an early grave, I realised that I didn’t HAVE to live in a permanent state of fear and anxiety. I had options. And I had to face the fact that if anything happened to my children because I was too complacent or too scared to leave, I could never forgive myself. So I took what was left of my family and returned to the UK – my country of birth. What really makes me sad is the gradual loss of affection I had for South Africa, where I lived for almost 50 years. By the time I left, all I felt was fear and loathing, and those feelings are slowly being replaced by disinterest. I’m so sorry you lost your son. I wish you well and hope you stay safe. This country should be brought to the Human Rights Court in Europe with the amount of Terror the South African people are going through I think there is a third force that is causing these murders and crimes and I think that we in South Africa deserve a bit of respect considering we all pay taxes and get absolutely nothing back for it only death ! The South African Government SHOULD do something they are just lining their pockets and not giving a dam about us the last 4million whites and the 40 million Africans plus the Indian and colored and Asian population.If the human rights do not help we should all write to our respective countries and ask them for assistance, it’s just terrible getting old in this country it could be Gods own paradise. So so sorry for your loss he is definitely in a better place your darling boy and I am so so sorry !! Thank you for your support and comment Muriel. I think your point about the government doing something is so true. What I can’t understand is how the murder and crime rate dropped for the world cup period and yet it is now up to its highest level again. Obviously there is something that might work. I think your idea of writing to our governments is actually a good idea. The more people who talk, the more people have to listen don’t they? What’s the difference between SA and a country like Libya, Syria or Afghanistan where the rest of the world have gotten involved due to human rights concerns? I’m reading this through a link a friend on Facebook shared. I identify with this story too much. I too lived on a farm, where the sound of gunfire and helicopters were almost a weekly occurrence. I did so for more than 15 years and it has left me extremely traumatised. I can count on 2 hands the number of people I personally knew, who have been murdered, some of them in the most brutal fashion. Regrettably while we have the current vacuum in leadership we find ourselves with at the moment, it’s only going to get worse. And even if we get someone in to turn it all around, that’s going to take a lot longer to do than it took to get where we are now, and that’s the truth. Just on Friday night, I tried to call the SAPS reaction vehicle in our area because of a visitor at our complex causing a problem. I told them he was drunk and trying to leave the complex without an exit code, but most importantly that he was behind the wheel drunk. They quite blatantly told me that I should refer the matter to the Metro Police. I told them there wasn’t enough time for that, and what if he has an accident? They then asked me if he had had an accident, to which I replied “No, but do we have to wait until he does, or kills someone?”. They then said they were on their way, but never arrived. The trust is, most of the members of the SAPS bar a few just couldn’t care less. The justice system in this country is theoretically one of the best systems in the world, if we could only execute it effectively that would make the world of difference, but while cadre deployment and employment of people in the justice system (including the SAPS) is based on colour alone, we don’t have a hope in the world of getting it right. My deepest and sincerest sympathy with your loss. I do hope you find peace, if that’s at all possible. I don’t want to be presumptuous, but in order to find peace for myself, when someone hurt someone I loved dearly, I had to forgive them without condition. Hard, but I’m now able to move on. May or may not be for you, I’m just making the suggestion because it worked for me.